It’s been exactly 11 days since the race. If you don’t read my blog on a daily basis, then I should tell you I’m talking abut the longest ultra-marathon I ever ran: 222 kilometers. In 31 and a half hours. The blisters almost healed. Some of my toenails are still crying, but, overall, they’re much better than a week ago. Sleep patterns are normal again (I don’t fall asleep in the middle of the day, nor do I wake up in the middle of the night, all pumped up and energized). The dust slowly settles over those days, over the images – still vivid in my mind -, over the medal and over the memories. Time for a roundup. Now, that the wind has calmed, let’s see what I take with me from this race. I think the most powerful memory about this race is literally the race. Each and every minute of it. Some of my readers told me the race reports (you can start to read them from here, with the first marathon) were a bit dramatic and focused too much on the painful part. Well, I can’t hide the fact that, for a big part of this race, I had to fight with pain. But, beyond pain, the entire experience was surreally beautiful. I can’t describe each and every step of it, because it will take hundreds of hours, but, believe me, each and every step of it was absolutely beautiful. For the first 130km I managed to keep a very good level of presence. Literally, for the first 130km, I focused only on the next kilometer. And then on the next one. And the next one. If you fancy Eckhart Tolle, this is about “being in the present”, being there. That’s exactly what I was able to do for many hours and I’m really grateful for that. I expected to engage in deep meditation during this ultra-marathon, and, for many hours, I succeeded at it. After km 130, I was still present, only at a different level – namely, I had a lot of pain to manage (bot more on that in a few paragraphs). How Many Marathons Are In An Ultra-marathon? Just for the record, here are the times for the 5 marathon splits. My GPS watch stopped here: 196.68 kilometers, after 27 hours and 30 minutes. I can clearly see how the heat impacted my speed. As the heat went down, my time per marathon slowly increased. But at the end of the fourth marathon I was already injured, and that showed up in the time on the last part of the race. Many friends asked me how I managed so much pain during this race. First of all, I want to tell you that I’m not proud of this. A lot of this pain could have been avoided. I did a huge mistake (wearing the wrong type of shoes) and I paid the price. So I don’t take any extra credit for finishing the race with blood in my shoes. On the contrary. I could have finished this race with at least one and a half hour earlier (and no injury), if it wasn’t for that stupid mistake and if I would took the time to get some proper long distance running shoes. A large part of the injuring came from improper equipment, so after the dust settled, I did some research. Here are a few links about running gear, running nutrition and supplements, and even gifts for runners (yes, that’s a thing). Also, if you’re curious about minimalistic running shoes (which are a thing too, apparently, you can read more here). But, back to the pain management, I can tell you upfront that it wasn’t only one way to cope with. There were many, and not all of them worked at the same time. In the beginning of the race, when my mood was lighter and I had a broader attention scope, I managed the pain my remembering a thing I read on a runner’s blog. Before the race I did a lot of research on ultra-running, and one of the blogs I read quite often was Jonathan Savage’s felrrnr.com. 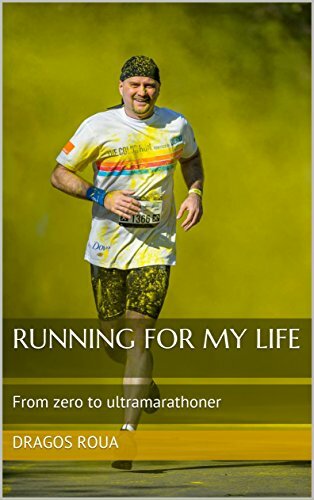 It’s actually a wiki, in which he shares his (wide) experience as an ultra-runner. On one of these pages he made a list with stuff you encounter when you run an ultra-marathon, from falling asleep to entering into hypothermia. At each of these problems, he listed a remedy. For instance, on the hypothermia, he said: “be sure to have extra layers in your drop-off bag”. But, and here comes the funny part, there were a lot of these problems with this only “solution”: “you’re running an ultra-marathon, what would you expect?”. Another way to manage pain was to detach from it. Not by trying to suppress it, but by observing it and accepting it. When the pain threshold became too big I started to just observe it. I did my best to stop any conscious response to pain (like complaining, for instance) and I just stayed there, continuing to run, walk or crawl (depending on my current position in the race). I’ve once read something in a Buddhist book (or hear it a conference, maybe): “If you look at a storm cloud, from a distance, it looks all dark and heavy and powerful. But if you go close to it, you don’t see the cloud anymore, you see just tiny drops of water. Our thoughts and sensations are the same. If you can observe them long enough, you’ll see they have no substance of their own.”. And, for a while, that worked too. For a while, pain perception dissolved by being observed. As I was approaching the end of the race, I realized that I can control the pain by controlling my exposure to painful stimuli. If I was exposing myself constantly to pain, my perception was less painful. My body adjusted. But if I stopped at a refreshment point, where, for a while, I was relieved, when I started to walk again, the pain was even more intense. So, I decided to skip a few refreshment points and keep a constant pace. That worked too, for a while. Here, the answer too is “more than one thing”. Probably the most effective “pusher” is the joy of running itself. It’s the meditation state I achieve at a certain point, from where I am present and I am stillness in movement. I know it sounds strange, but that’s my experience with it. Especially during the first stages of the ultra-marathon (basically the first 12 – 15 hours), when my body was still balanced, I experienced this “stillness in movement” quite a lot. Then, I started to create some mental images. One of them was about all the people who encouraged me for this race. I announced that I’ll run at Ultrabalaton with 7 months before the race. I did fundraising for a charity. I talked to each and every person willing to listen to me that I will run this race. The main reason, at that time, was accountability. And it worked, the fact that I told to so many people I will run a huge race made me push forward. But what worked even better was this image: I organized all the encouragements, all the good thoughts, all the hugs I got for this race in a huge, fluffy ball. I pictured it just behind me, 2 or 3 times bigger than me, and the energy of the encouragements made that ball to roll, slowly pushing me forward. It was like something was literally pushing me ahead. At times, when I was creating this projection, I literally felt like I didn’t even run. I was gently pushed forward by a huge, soft, rolling ball. And probably the most effective “pusher” at all was a small discussion I witnessed, just the day I left Bucharest for the race. That morning, I went to Bianca’s school to bring her something she forgot. I found her with her colleagues and when she saw me, she turned to her colleagues and told them: “Hey, this is my dad and he’s going to run a 220 kilometers ultra-marathon”. The expression on the face of those kids was priceless. But the expression on Bianca’s face when she was telling them that was even more beautiful. I simply couldn’t destroy that look on her face. I just couldn’t. you’re crazy, Man!!!! this is almost unbelievable!!! How many calories did you burned? What about weight loss during the run? Thanks, buddy! Glad to hear from you, in the first place 🙂 I burned around 20.000 calories, but I ate at refreshment points. I didn’t measure the weight loss, but I estimate between 2 and 4 kilos. Salut. Da, am luat pentru prima parte a cursei adidasi ficsi pe picior. In mod normal, se folosesc adidasi cu cel putin un numar mai mare, pentru ca, in efort, picioarele se umfla. Aici speram sa acopar prima parte a cursei mai repede, dar caldura nu m-a lasat, dimpotriva, mi s-au umflat picioarele si mai mult. Am avut si o pereche potrivita, dar abia in a doua parte a cursei, de pe la km 129, cand deja ma accidentasem (basici, unghii dislocate). Thanks for the nice words! Yes, I share it with the intent of being helpful to other people as well and I’m grateful for all the other people who shared their experiences as well. This is how we find our way, by helping each other. Hi, glad to hear of your accomplishments and the strategies you used to manage your pain. Very interesting to hear the strategies you used during your race and how applicable they are to many other challenges. Hi, Dragos, I came across your blog while searching for more info about the raw diet. Just curious, are you still on a 100% raw diet? Especially seeing that you’re doing such intensive sports like ultrabalatons! Hi, I’m not raw vegan anymore, but still vegetarian and doing well. Oh, why not? Especially after seeing you write so much about the raw food lifestyle too! That’s insane. I didn’t know such a race existed. Talk about inspiration for running. If you could do only 1 thing differently next time, which one would it be? Keep up the great hustle! I am taking baby steps towards such an achievement… started announcing to the world that I will do “220 by 2020” meaning, I will complete a 220km ultra marathon by year 2020. I am very nervous about it, but I have started researching and preparing. Baby steps, because I am going to do my first 80km ultra in 2 weeks and need to scale up quickly to be eligible (Two 160km ultras) and ready. Your blog gave me the real feeling like doing one. I could experience (at least a fraction of it) your experience by reading the entire run. I could feel tears of joy in my eyes when you crossed the finish line. Gave me lots of positive energy and courage to embrace it. THANK YOU !! !